Tusk, who was Poland’s prime minister at the time of the 10 April, 2010 tragedy in Russia’s Smolensk Region, did not mince words denying the accusations by current Polish Defense Minister Antoni Macierewicz. 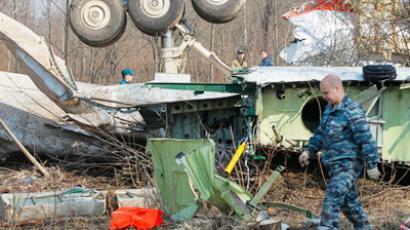 Macierewicz claimed that the circumstances of the crash revealed during the conversation Tusk had with former Russia’s Emergencies Minister Sergey Shoigu and then-Russian PM Vladimir Putin on the day of the tragedy run counter to the conclusions of the Interstate Aviation Committee (IAC) and the Tusk government commission probe. On Thursday, the Polish Defense Ministry posted what it said was never-published footage of a meeting between Tusk on the one side and Putin, Shoigu and other high-ranking Russian officials on the other on the day of the catastrophe. In the video, taken on the same day President Kaczynski’s plane crashed near a Smolensk airfield, Shoigu can be seen briefing Tusk on the initial findings near the site of the crash, saying that the plane hit the trees, overturned and then crashed into the ground. “More than a kilometer from here, where its [the plane’s] altitude was expected to be 60-80 meters, the trees are cut at the height of 8 meters. As a result, 200 meters from here the first collision with the ground occurred,” Shoigu said. He added that the plane apparently had its chassis out and turned upside down, after which the fire broke out that was contained in the first seven minutes following the crash. Yet, for some reason in the video published and subtitled by Poland's defense ministry, Shoigu's clear mention of a distance of "more than a kilometer" in Russian is captioned as "about 8 kilometers away [translator: more than a kilometer away]." It's not clear where the "8 kilometer" reference comes from and why that discrepancy is there. "This video is of course not new, it has been on YouTube for two or three years. In my opinion this is only the government's propaganda, which wants to create a new view for the Polish society that Donald Tusk had knowledge about reasons of the Polish airplane crash and he hasn't informed Polish society, and in the government's propaganda opinion it's a crime, which Donald Tusk can now be accused of," Tomasz Jankowski from the European Center of Geopolitical Analysis, and General Secretary of Poland's Zmiana party, told RT. Contrary to the claims by Macierewicz that the meeting was kept secret by Tusk until the release of the footage by the ministry, it was in fact made public soon after the tragedy, as it was held in the presence of Polish and Russian journalists. The video was aired by Rossiya 24 channel on April 10 as it ran a report on the course of the investigation. 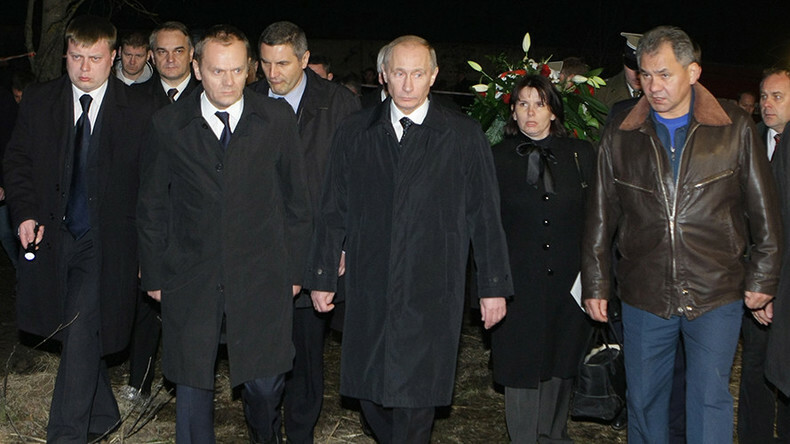 In an interview to Gazeta Polska, to be published Wednesday, Macierewicz said that Tusk “did not care to inform anybody” about the conversation with Putin, claiming that the “key point” is that it “demonstrates absolutely another course of the tragedy,” RIA Novosti reports. 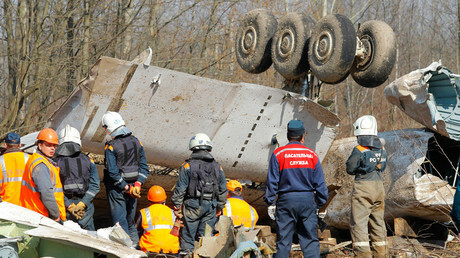 The Polish government report prepared by the Investigative Committee, chaired by the then-Interior Minister Jerzy Miller in 2011, stated that the plane had collided with a tall birch tree several hundred meters short of reaching the runway as it was flying below the allowed altitude with no vision of the land due to poor weather conditions. Upon winning parliamentary elections last October, Polish right-wing Law and Justice party (PiS), to which its leader, twin brother of the late Polish President Kaczynski, Jaroslav, as well as Macierewicz belong, have re-launched the investigation into the tragedy and set up a new commission aiming to review the Miller report findings. The current Defense Minister, Macierewicz, had in fact been heading the alternative Parliamentary Committee created by a group of Polish MPs that claimed Russia was complicit in the tragedy and speculated on “explosions” in the plane’s hull before the crash. On September 15, the newly-formed commission published preliminary results of its probe, with the Defense Ministry calling the official probe a result of “falsifying, manipulating, avoiding, and hiding” the truth behind the tragedy. The authors of the report argued that the plane began to fall apart mid-air some 900 meters from the site of the crash arguing that the fire erupted while the plane was still in the air. The exact seconds of the crash, they claim, are missing from the recording of the flight because they were cut out. However, the new report has been blasted by the Polish opposition as an attempt to manipulate public opinion to serve the right-wing Law and Justice party’s agenda. “We know your real purposes. It is first of all manipulation of public opinion by means of endless repeating lies in a bid that the larger part of society would finally believe in them. You are creating myths, repeating slogans, demonstrating pictures – they are all fakes,” Pawel Suski, MP from the liberal-conservative Polish Civic platform (PO) said on Friday, as cited by TASS. Another MP, Marcin Kierwinski, accused Macierewicz of “misinformation which poses a real threat to the country’s security,” adding that no compelling evidence in support of the new version has been presented by the commission so far. Previously, Macierewicz went as far as saying the crash might have been a “terror attack” by Russia “aimed at depriving Poland of the leadership”. “After Smolensk, we can say that we were ... the first great victim of terrorism in the modern conflict, that's playing out right before our eyes,” he said in March. The plane with 96 Polish officials, including President Kaczynski and his wife, senior military commanders and several lawmakers crashed as it was heading to a ceremony to commemorate the 1940 Katyn Massacre, in which thousands of Polish officers were killed by Soviet secret police.